It started at my Tuesday rughooking group. I spontaneously asked everyone what their favorite Christmas carol was. The majority picked “Oh Holy Night”. One person picked “Oh Come All Ye Faithful”, and one picked “Silent Night”. After considering “The Holly and the Ivy”, and “I Saw Three Ships”, I finally chose “I Heard the Bells On Christmas Day”. I just have always loved it. When I got home from rug group, I looked it up and listened to it again. And then I read a little more about the song’s history. It was Christmas morning, 1863. Henry Wadsworth Longfellow was in Cambridge, Mass., and it had been a terrible, depressing period of his life. He was still grieving for his beloved wife, who had died in a household fire. Longfellow was scarred for life trying to save her, and was so badly burned he could not attend her funeral. The Civil War was tearing apart the country, and this particular Christmas came only six months after the battle at Gettysburg, where 40,000 soldiers were killed. So many boys were far from their families, and very many would never return home. And Longfellow had just found out his own son had been wounded, serving in the Army of the Potomac. So as he listened to the church bells ring on Christmas morning, this American poet sat down, suffering at the state of his heart, and of the world, struggling to find the hope of the Christmas message. That morning, he wrote Christmas Bells. About ten years later, the English composer John Calkin set Longfellow’s poem to music. 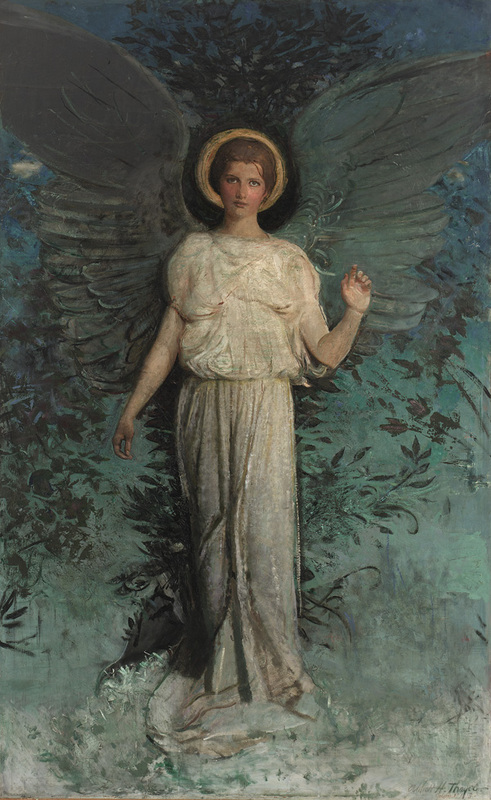 The painting at the top of this post is Winged Figure (The Angel) painted in 1918 by American artist Abbott Handerson Thayer, now in the Freer Gallery of Art. 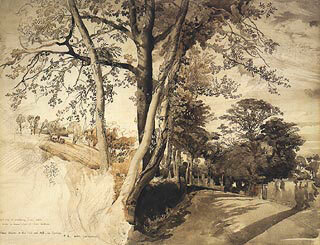 This is a drawing by John Ruskin, titled Trees in a Lane, Ambleside, done in 1847. 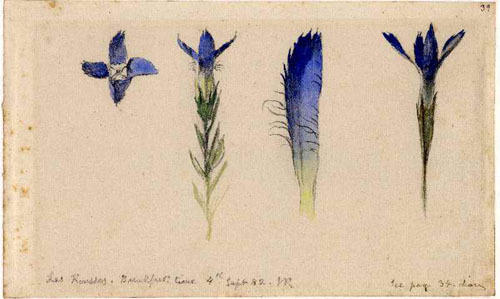 John Ruskin (English, 1819 – 1900) was the leading English artist, poet, art critic and drawing teacher of the Victorian era, as well as an art patron, draftsman, watercolorist, a prominent social thinker and philanthropist. He wrote about geology, architecture, myth, ornithology, literature, education, botany and political economy. “Let two persons go out for a walk, the one a good sketcher, the other having no taste of the kind. Let them go down a green lane. There will be a great difference in the scene as perceived by the two individuals. The [second mentioned] will see a lane and trees; he will perceive the trees to be green, though he will think nothing about it; he will see that the sun shines, and that it has a cheerful effect, but not that the trees make the lane shady and cool; and he will see an old woman in a red cloak— et voilà tout! But what will the sketcher see? His eye is accustomed to search into the cause of beauty and penetrate the minutest parts of loveliness. He looks up and observes how the showery and subdivided sunshine comes sprinkled down among the gleaming leaves overhead, till the air is filled with the emerald light, and the motes dance in the green, glittering lines that shoot down upon the thicker masses of clustered foliage that stand out so bright and beautiful from the dark, retiring shadows of the inner tree, where the white light again comes flashing in from behind, like showers of stars. Here and there a bough is seen emerging from the veil of leaves. There are a hundred varied colors, the old and gnarled wood is covered with the brightness; here is the jewel brightness of the emerald moss; there, the variegated and fantastic lichens, white and blue, purple and red, all mellowed and mingled into a garment of beauty from the old withered branch. Then come the cavernous trunks, and the twisted roots that grasp with their snake-like coils at the steep bank, whose turfy slope is inlaid with flowers of a thousand dyes, each with his diadem of dew. And down, like a visiting angel, looks one ray of golden light, and passes over the glittering turf -kiss -kiss -kissing every blossom, until the laughing flowers have lighted up the lips of the grass with one bright and beautiful smile that is seen far, far away among the shadows of the old trees, like a gleam of summer lightening along the darkness of an evening cloud. 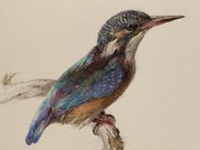 You can actually go to the website of the Ashmolean Museum at Oxford, at ruskin.ashmolean.org to look at many of Ruskin’s wonderful collection of drawings, and the lectures for which he collected the drawings. There are even eight drawing classes you can take yourself. 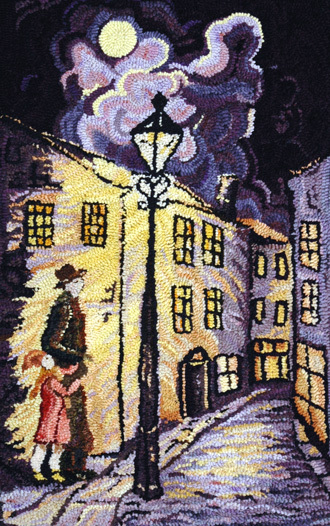 Some people create beauty with words, some with drawing or painting, and some with hooked rugs. But looking, closely, is the common thread. Hope you find wonderful things to observe during these summer days! As we near the celebration of this most Christian holiday, Christmas, I thought we could look at a few beautiful paintings of angels. The word “angel” comes from the Latin “angelus”, meaning messenger. 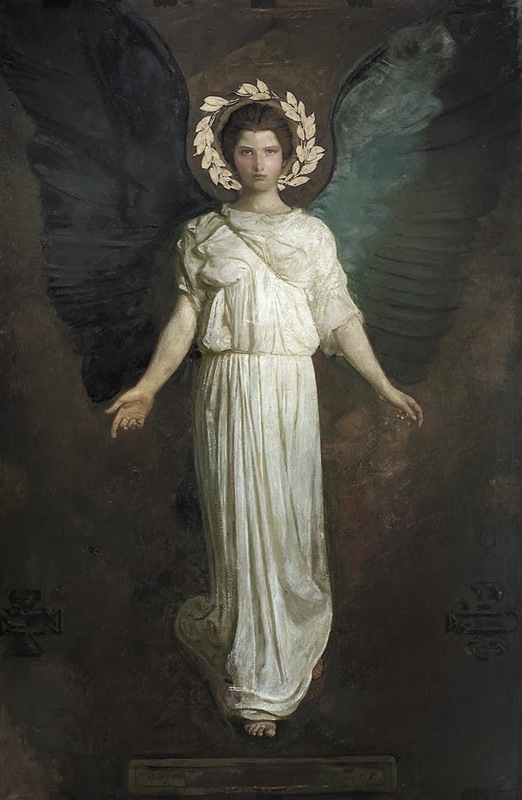 But angels also appear in the writings of the ancient Egyptians and Greeks, in Judaism, in Islam, in the Baháí and Sikh faiths – always spiritual beings intermediate between God and humans. 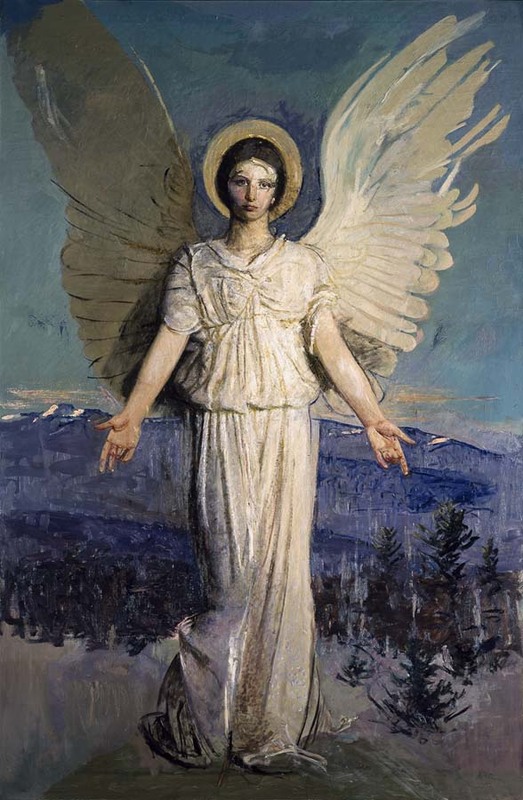 The lovely painting above, by Abbott Handerson Thayer (American, 1849 – 1921), is A Winged Figure, from The Smithsonian’s Freer Gallery of Art. When looking online at the beautiful Christmas hooked rugs to be seen – designs of Santas, reindeer, snowmen, decorated trees, shining stars and snowflakes, woodland animals – there are surprisingly few of angels. Maybe I have just missed them. Angels have been, in art and sculpture, most often depicted as male humans. 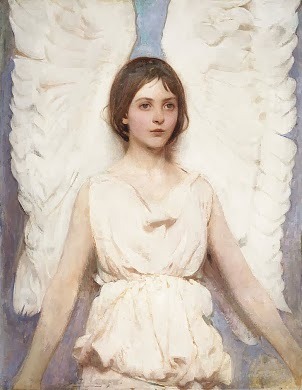 The Thayer angels are young women, and are so straightforward, with a direct, kindly gaze. All of Thayer’s angels communicate a sense of deep security and peace. And as we approach another Christmas, security and peace, in your life and creative work, is my Christmas wish for you. I’ve been waiting for Election Day to share this rug with you. 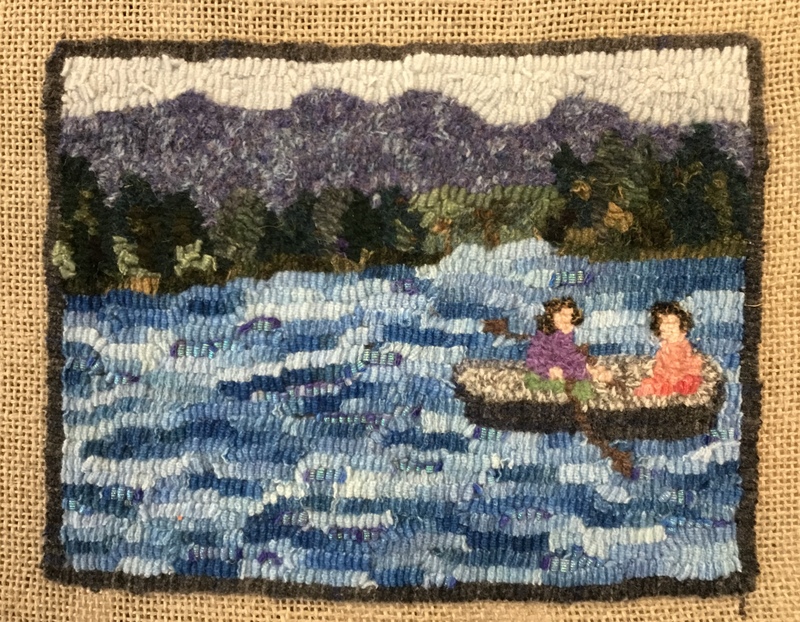 In a recent blog post I came up with the term “spirit rug” for those special projects when we just seem to transfer our deepest feelings, faith or courage into its loops. 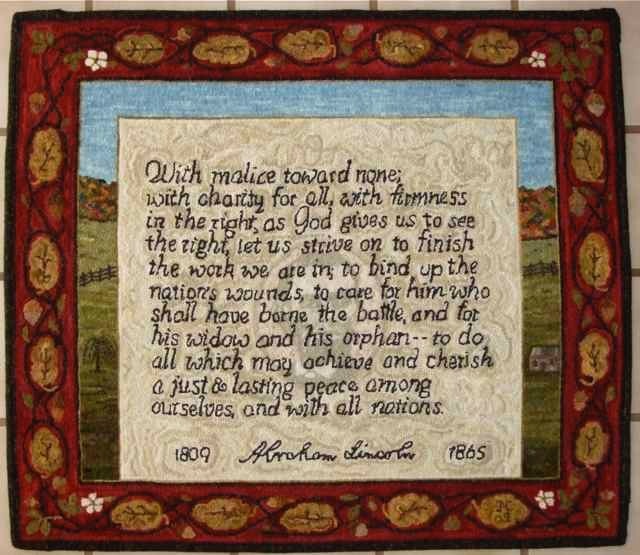 And Ivi Collier, of Nottingham, Maryland, sent me the photo above, and the story of her Lincoln Rug. 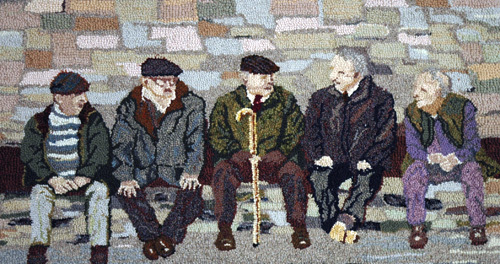 “I knew I’d make a Lincoln rug from the day I began hooking. The approach of the 200th anniversary of his birth (2009) prompted me to get started. My extensive research into Lincoln led me to choose to feature the well-loved statement from his second Inaugural Address. The US was once again sending troops to war and the words remained compelling. Having learned how shattered the nation was when Lincoln died, I wanted to incorporate Victorian symbols of mourning into a border. I found a William Morris border containing many of these elements and adapted it to the proportions I needed. 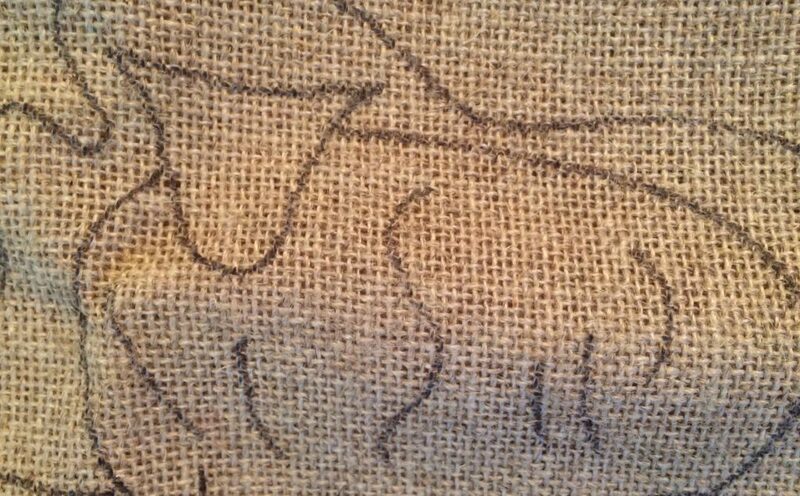 A simple rug, words with a fairly complex border, was drawn on white linen. There was surprisingly little angst involved in any of this. I was making a rug just for me and I had it ready to go. I worked back and forth between the border and lettering and pretty soon realized I had far too much white space surrounding the statement. Uh oh. This was the point where I’d normally start hyper-ventilating but instead it felt like an opportunity to include more symbols that have kept Lincoln connected to us. I drew new inside borders and went to work free-hand on 3 new inside margins. An American landscape developed, complete with a log cabin and split-rail fence. Extra space at the bottom was filled a replica of Lincoln’s signature and the years of his birth and death. “The final stage began. I hooked the face in closely matched shades of different colors as it enabled me to get the glow I wanted while keeping it very subtle. The reward for reading the words was the discovery of Lincoln “standing” behind them. With all the stress of this very, very long election, it is finally the day that we get to use our free and precious votes. Go vote. And thank you, Ivi, for sharing the story of this rug with us, and reminding all of us of the strength and history of our country. This rug is, of course, Ivi’s own, and so is protected by copyright. So…hook in hand, ready to begin, I realized I had to stop. What does a sheep’s head look like, anyhow? And that got me reading about our friends, the sheep. There are over 1,000 breeds of sheep. There are more breeds of sheep than breeds of any other livestock species, except poultry. Sheep were among the first animals domesticated. An archeological site in Iran produced a statuette of a wooled sheep which suggests that selective breeding for woolly sheep had begun to occur over 6000 years ago. 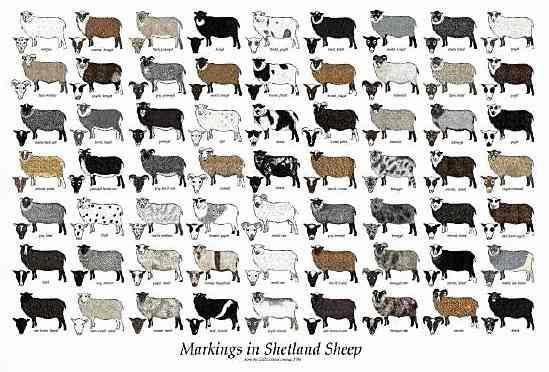 Sheep breeds are divided into long-wool, medium wool and fine wool. And then there are those breeds grown primarily for meat. In England, the place I have lived closest to flocks, one day you would hear the ewes bleating very loudly, when their lambs were taken away to market. That’s why I don’t eat lamb. The Merino (ewe and lamb pictured just above) is one of the oldest breeds of sheep in the world, with one of the finest wools. Merino sheep originally were developed in Spain, and during the Middle Ages, Spain’s wealth was based on these sheep, and it was a capital offense to export a Merino sheep. They are regarded has having the finest and softest wool of all sheep, and many other breeds were cross bred from Merino. Fine wool sheep like Merino produce wool fibers with a very small fiber diameter, usually 20 microns or less. And mind you, there are 25,400 microns to an inch. Fine wool sheep account for more than half of the world’s sheep population. Found throughout Australia, South Africa, South America, and the Western United States, most sheep of this type are Merino or trace their ancestry to the Merino. The Rambouillet (pictured in the top photo) is related to the Merino, and is the most common breed of sheep in the U.S., especially the western states (California, Colorado, and Wyoming) where the majority of sheep in the U.S. can still be found. No wonder people try to get to sleep by counting sheep. Wool is a freely-traded international commodity, subject to global supply and demand. Wool represents only 3% of world fiber production, but it is important to the economy and way of life in many countries. Australia dominates the world wool market. Though China is the largest producer of wool, it is also the largest wool buyer. 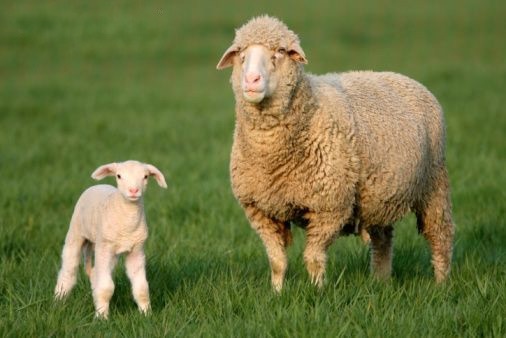 The United States accounts for less than 1 percent of the world’s wool production and is a net importer of wool. Probably because of us rughookers. Marvelous! What a great rug! And no talk of sheep rugs could go without mentioning Patty Yoder (1943-2005). 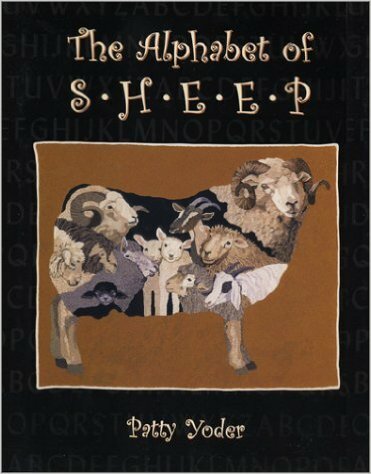 If you ever get a chance to see her 2003 book, The Alphabet of Sheep, go through it, slowly, and you will fall further in love with sheep, as Patty clearly did. She hooked them so well, and so creatively. It’s a hard book to find, and currently sells online for about $200+. How I wish I had met Patty! 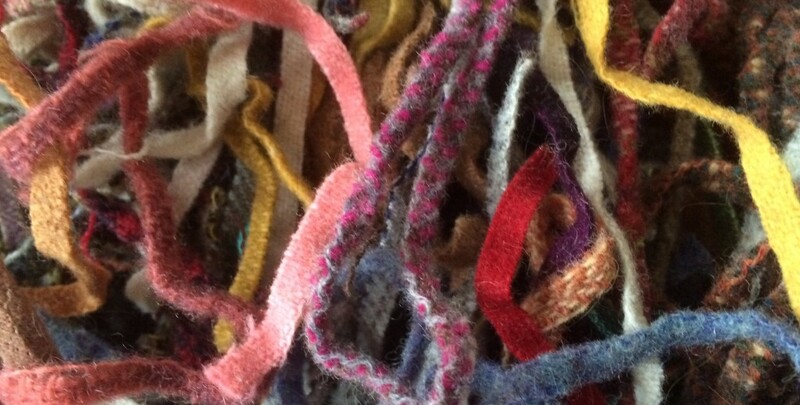 Or head up to the Shelburne Museum in Shelburne, VT to see many of Patty’s rugs in person. The museum is online at shelburnemuseum.org. A great deal of fuss, noise, fanfare, or protestation over something of little or no substance, importance, or relevance. For example, My opponent has been making outlandish claims about my track record, but I assure you, his remarks are more cry than wool. Variants: All cry and no wool, and Great cry and little wool. if you describe someone as dyed-in-the-wool, you mean they have a very strong position and will not change (always before noun). Example: He’s a dyed-in-the-wool traditionalist where cooking is concerned – he won’t have any modern gadgets in the kitchen. or He’s a dyed-in-the wool farmer. From clothing made from yarn that was dyed before weaving, so the dyeing process was more likely to be thorough, and the fabric would retain its color longer. Indulging in wandering fancies or absent-minded indulgence in fantasy; daydreaming. As in Stop your woolgathering and do the dishes! 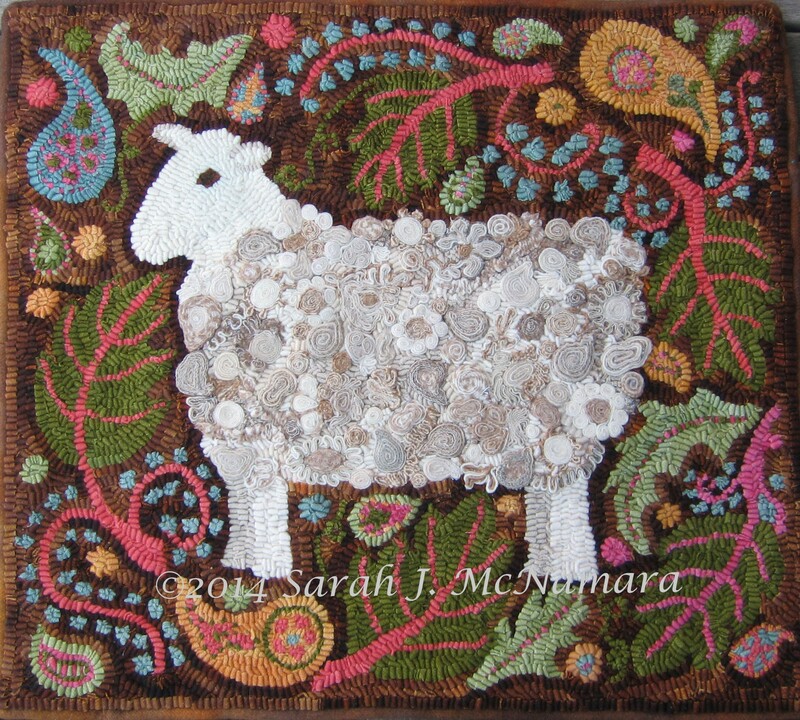 Origin: the practice of wandering to gather tufts of wool caught on thorns and hedges. So here is just a bit of what I learned about storytelling. 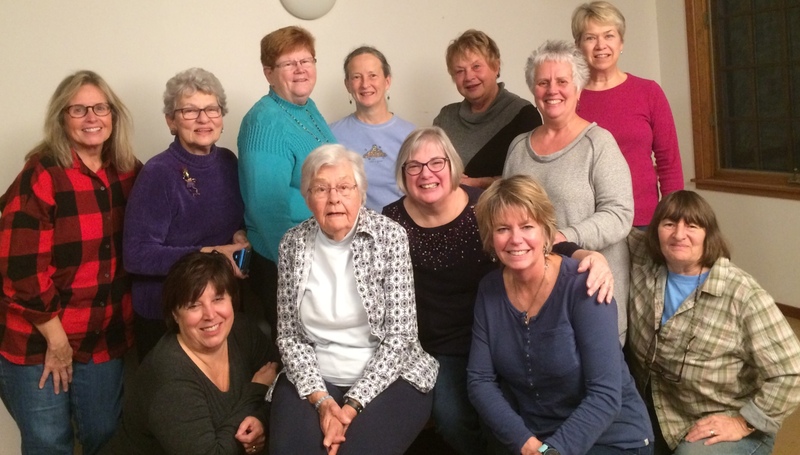 The reminiscences we know and share about our families – those stories we heard growing up from parents, grandparents, uncles and aunts, give us a sense of our “intergenerational self” – “I’m me, I have this family, who has this history”. The stories give us a sense of perspective on our own lives. And we, in turn, are story bearers for the younger generation. We learn about values, about tragedy and overcoming it, of hard times and the best times. 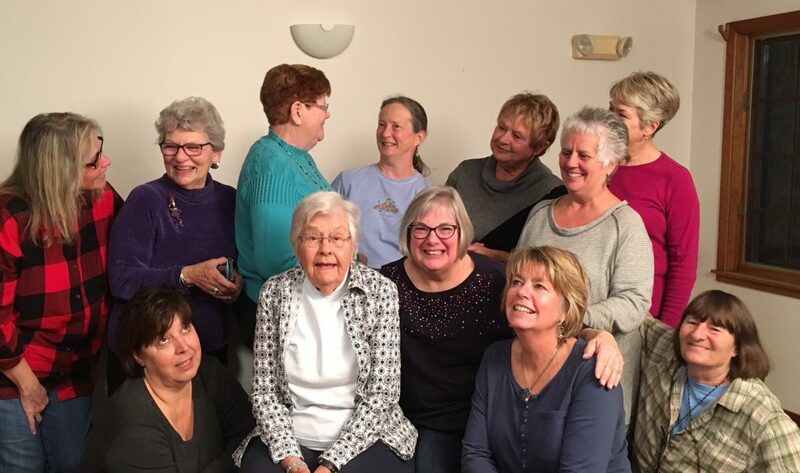 And all the little stories about different family characters, their histories and quirks, become little parables – perhaps about how to handle money, or sickness, when to take risks, the good humor between friends, about the woes of a bad marriage or addiction, or the joys of accomplishment or adventurousness. This made me realize I have never made a true storytelling rug. 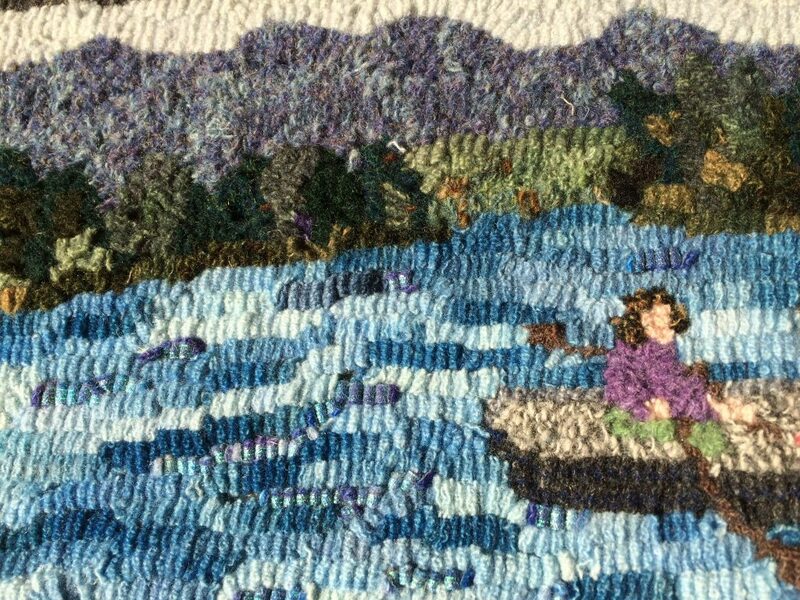 I mean, I can tell you a story about many of my rugs, but none tell a particular family or life story the way that Heather’s rugs do. And the best part of the program was the second half, where the leader talked about how to trigger memories and stories. Triggers to memory and the stories that go with it are often just stopping to think about shared times – what was a typical Sunday dinner, who was there… or what were family sayings, and how did they get started. Try to get beyond the often-told stories by using your senses as a trigger. My sister, when prompted to think about sound triggers, remembered the sound of my mother’s sewing machine and that brought back all kinds of associations she had not thought about in years – the possibility of a new dress being made, maybe! And I remembered a sound-memory – coming home from school and hearing my mother ironing clothes while listening to a Red Sox game on the radio, which brought back all sorts of other “coming home” memories. To this day, there is something quite soothing to me in hearing the sound of a ball game in the background. And there are smell memories- the smell of burning leaves in a bonfire, your grandmother’s perfume, ginger cookies or fresh bread, skunks, or for many, the fond smells of walking into a barn. There are simple “story prompts” – questions that just start you down a certain remembering path. Can you remember a favorite hiding place you had? Can you describe a walk around your childhood neighborhood? Were you ever dared to do something you didn’t want to do? Did you ever break something that belonged to someone else? Can you remember when you had to move from one house to a new place? The point of these questions to to just get family or personal stories to come to the top of your mind. There’s no right or wrong, and there may be stories we like telling, and some we don’t want to tell, which is fine, too. There have been thorough studies that show that kids who know family stories and history (what kind of work did your grandfather do, how did your parents meet, where did they go to high school, is there a family story about when you were born, etc.) have a much, much easier time getting through adolescence, and are better at facing challenges throughout life. And a good book was recommended: Black Sheep and Kissing Cousins: How Our Family Stories Shape Us, by Elizabeth Stone. It can be found here. I was afraid this post was not overtly about rughooking…but when I look at Heather’s rugs, I realize it is. 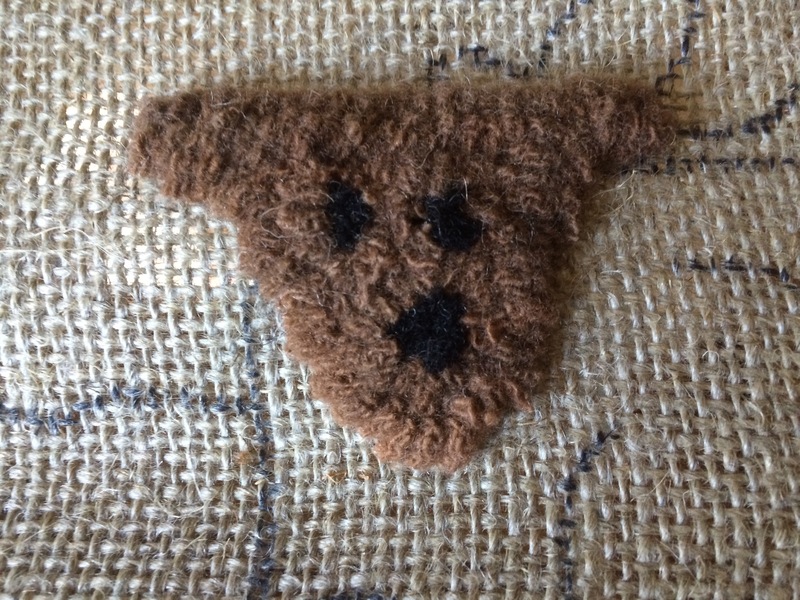 Even when we are hooking someone else’s patterns, or drawing our own cat or dog, we are expressing something about ourselves in our hooking. 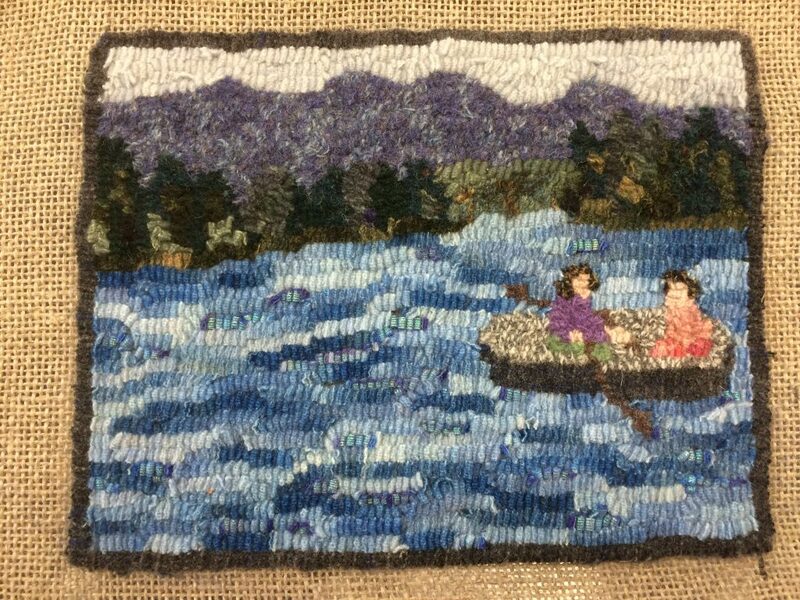 How much more could we express if we set out to purposefully create a “memory” rug that tells some piece of our own stories! – Molly Peacock, in her new book The Paper Garden: Mrs. Delany Begins Her Life’s Work at 72 . The photo at the top is mine, but taken at the Hooked Rug Museum of North America, online here. 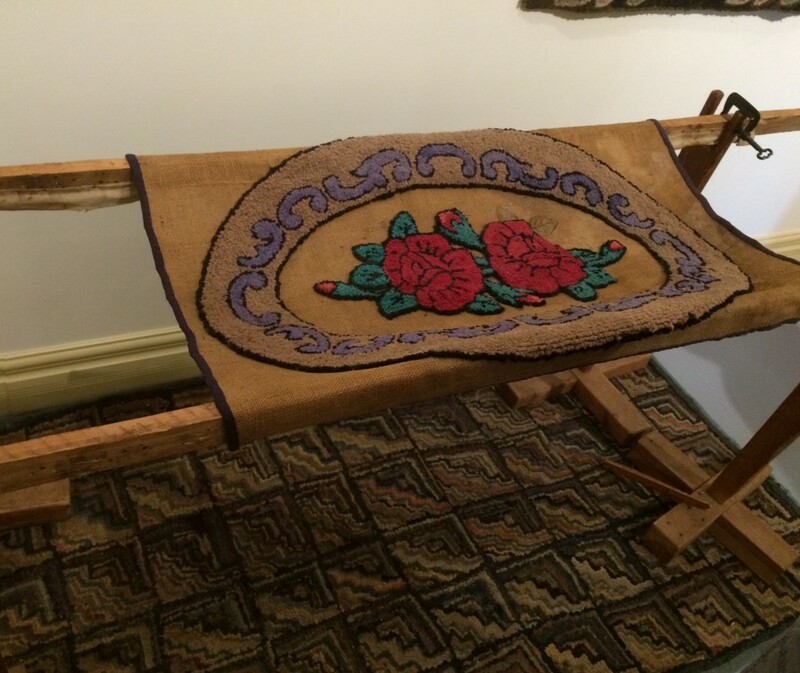 The Cheticamp frame and antique rug on it were donated to the museum by Linda Alderdice. More about Molly Peacock and her books can be found at www.mollypeacock.org.